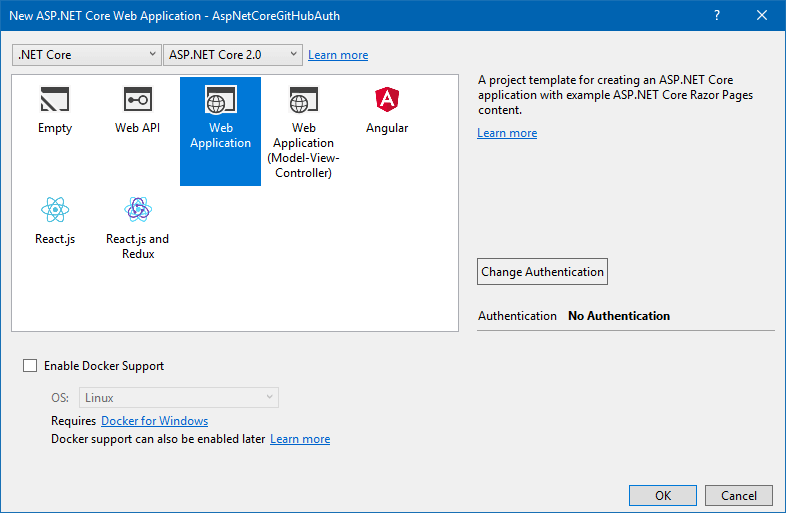 Almost 2 years ago I wrote a blog post about using the generic OAuth provider in ASP.NET Core. A lot has changed since then, so I thought it might be a good time to revisit this. 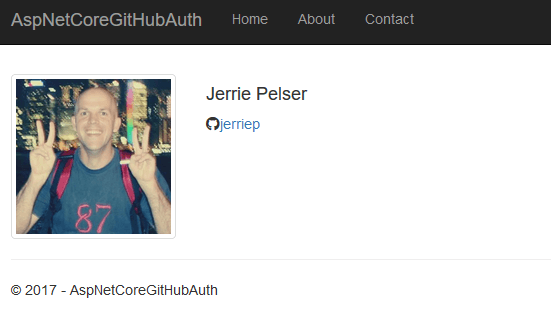 For this blog post, we will create a simple website which allows users to sign in with their GitHub credentials. 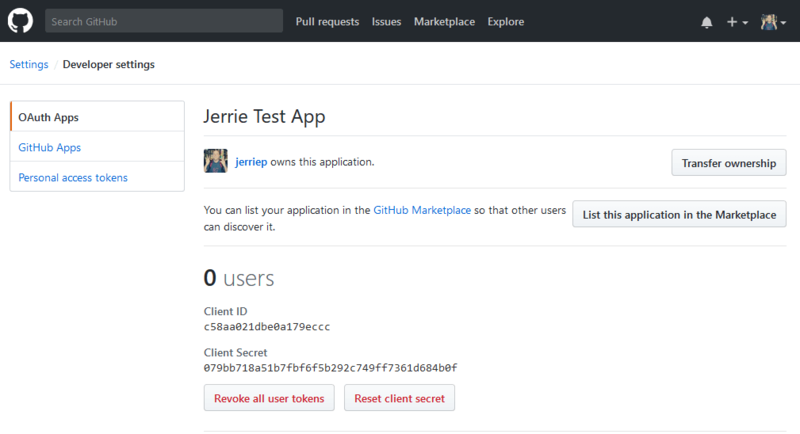 I will also demonstrate how we can store the access token received from GitHub to make GitHub API calls using Octokit. Before we get going, I would like to go through the OAuth 2 flow quickly so you can understand how things fit together. Regarding terminology, I will be referring to Consumers and Service Providers. 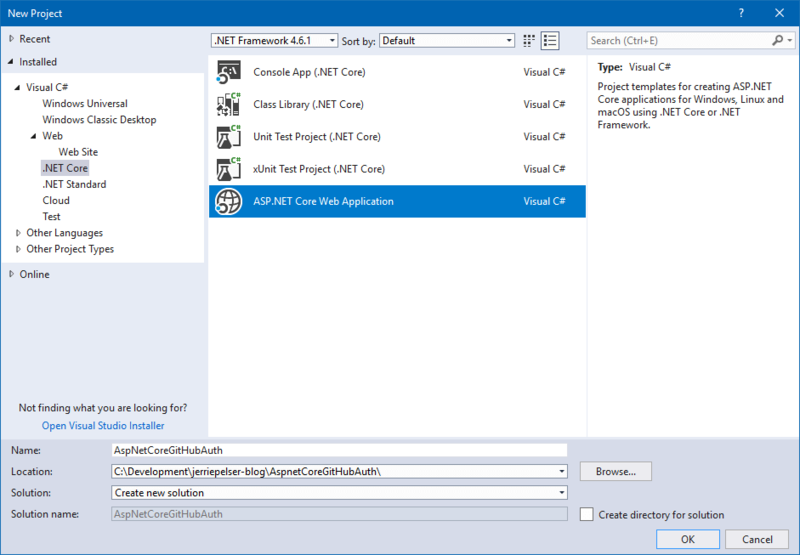 A Consumer is an application that will be requesting an OAuth token, so, for example, our ASP.NET Core application. The Service Provider is the application or service which authorizes the user and issues the token. 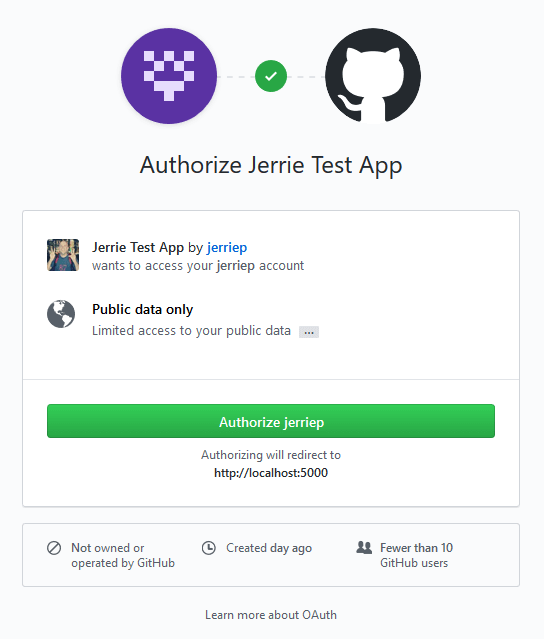 In this blog post I will demonstrate how to configure authentication with GitHub, so for the sake of this blog post think of GitHub as the Service Provider. Before anything can be done, you will need to register an application with the Service Provider. Typically you will need to specify a name for the application and a redirect URI. Once an application is registered, the Service Provider will provide a client ID and a client secret which is used during the authentication and token request process. The Consumer makes a request to the Service Provider authorization endpoint to authorize the user. The Service Provider authenticates the user and prompts them whether to authorize the Consumer to access their information. If the user authorizes the Consumer, the Service Provider redirects back to the redirect URI on the Consumer’s website with a temporary access code. The Consumer calls the token endpoint on the Service Provider website to exchange the code for a more permanent access token. Now, there are various little nuances between all the different Service Providers, but the flow described above covers the basics and holds true for most Service Providers. The Client ID and secret are obtained when registering your application on the Service Provider’s website. Some Service Providers may call them something else, like Facebook, for example, will refer to them as the App ID and App Secret. The Authorization and Token endpoints can typically be obtained from the developer documentation of the Service Provider. The redirect URI is something which you can specify when configuring the OAuth authentication on the Consumer. This needs to match up with whatever you specify when creating the application on the Service Provider. This will normally be referred to as either a redirect URL or callback URL or some sort of variation of that. 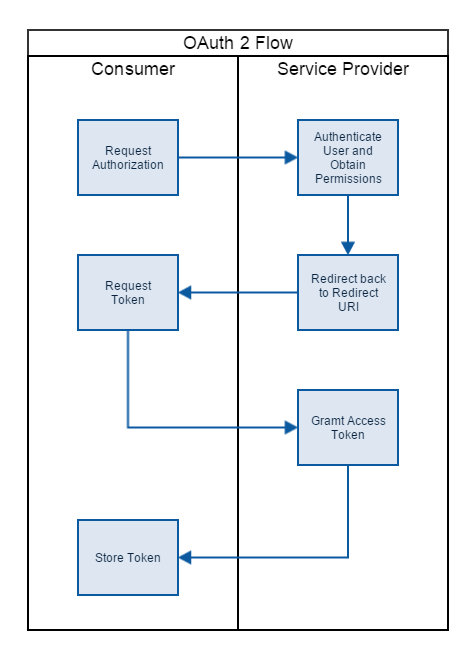 The Authorization endpoint will usually have the path /authorize, /authenticate, /auth or something similar. The Token endpoint will typically have the path /access_token or /token, so look out for those. Once done you can click the Register application button. Take note of the values for Client ID and Client Secret, as you will need those shortly when registering the OAuth middleware. 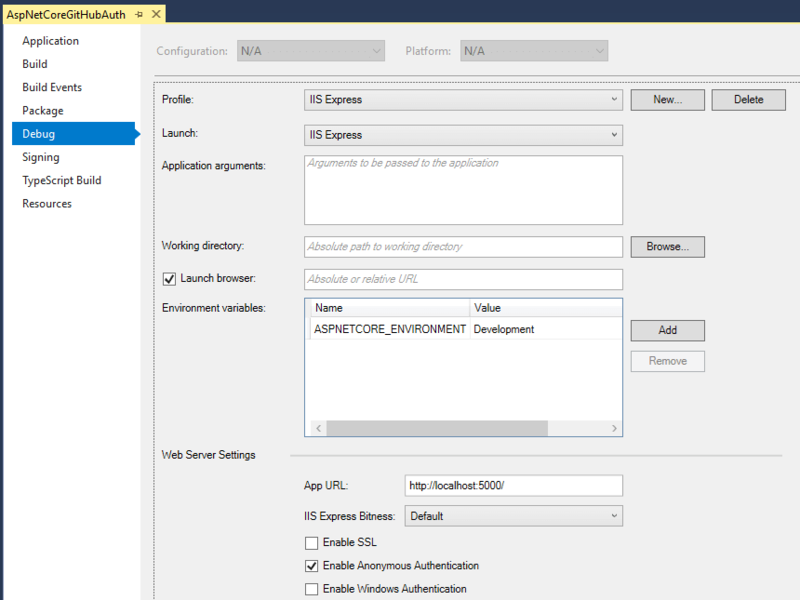 If you want to create an MVC application, then go ahead and select the Web Application (Model-View-Controller) template. You should still be able to follow along as the important stuff is done in the Startup file which is the same for Razor Pages and MVC applications. Once the project has been created you can go to your project Properties, and on the Debug page ensure you set the App URL to http://localhost:5000/. Alternatively, you need to change the application registration in GitHub to use the same port as your application. The call to AddAuthentication registers the authentication services. It specified the DefaultAuthenticateScheme and the DefaultSignInScheme as the cookies, and the DefaultChallengeScheme as GitHub. What this means is that when ASP.NET check to see whether a user is authenticated, it will use the cookie authentication handler. When we call ChallengeAsync() to log a user in, the GitHub authentication scheme (in other words the OAuth authentication handler) will be challenged. Finally, once the user is authenticated, their authentication information will be saved in a cookie, since that is the DefaultSignInScheme. If this does not make sense to you, I strongly suggest that your read ASP.NET Core 2.0 Authentication and Authorization System Demystified which explains all of this in much more detail. Next up we register the cookie authentication handler with a call to AddCookie(). 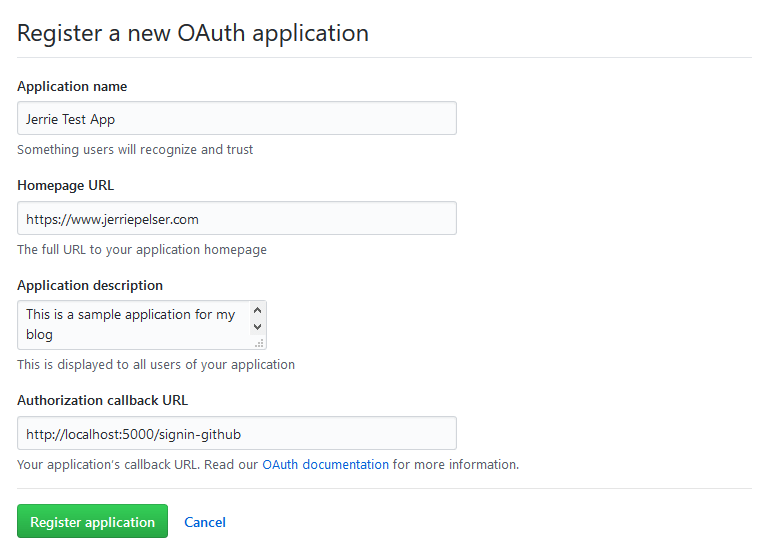 Then we register the OAuth authentication handler by calling the AddOAuth() method and setting the authenticationScheme parameter as GitHub (the same we specified for the DefaultChallengeScheme earlier). For the OAuth authentication handler, you need to specify the ClientId, ClientSecret and CallbackPath. The CallbackPath is the path where the identity provider will call back to after the user has authenticated (i.e. the callback URL we specified when we registered our application in GitHub). And then subsequently calling RunClaimActions, passing along the user object received from GitHub. This will ensure that the correct claims are created on our ClaimsIdentity. You will have noticed that the OAuth authentication configuration referenced the GitHub:ClientId and GitHub:ClientSecret configuration settings. You will need to update your appsettings.json file to add these settings. Specify the values for your own GitHub application which you registered earlier. I store these values directly in appsettings.json for demonstration purposes only, but this is not good practice. Please refer to Safe storage of app secrets during development in ASP.NET Core for some better ways to handle this. Note that we retrieve the claims stored for the user, and store the values for those claims in properties on our IndexModel class. This will allow use to use these values from the Razor page. 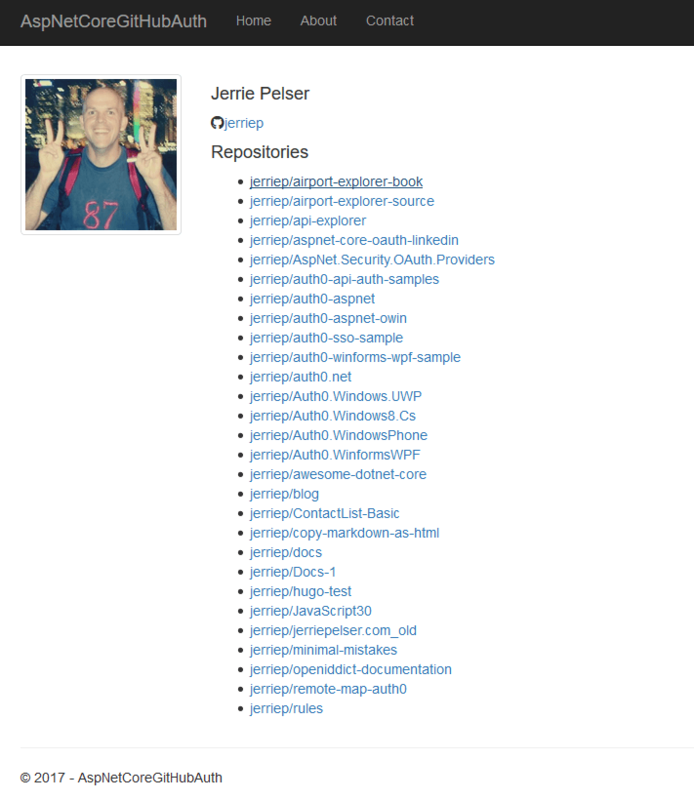 Let’s say that we want to display the list of repositories for the user on the page as well. To do this, we need to call the /user/repos endpoint of the GitHub API, passing along the access_token which we received from GitHub. Then in the IndexModel class, we can retrieve the access token by calling the GetTokenAsync() method, and subsequently using that to initialize the GitHubClient class and retrieve the repositories for the current user. We store the repositories in a new Repositories property so that we can use it on the Razor page. Also note that since we are now using async methods, I have changed the OnGet() method to OnGetAsync().